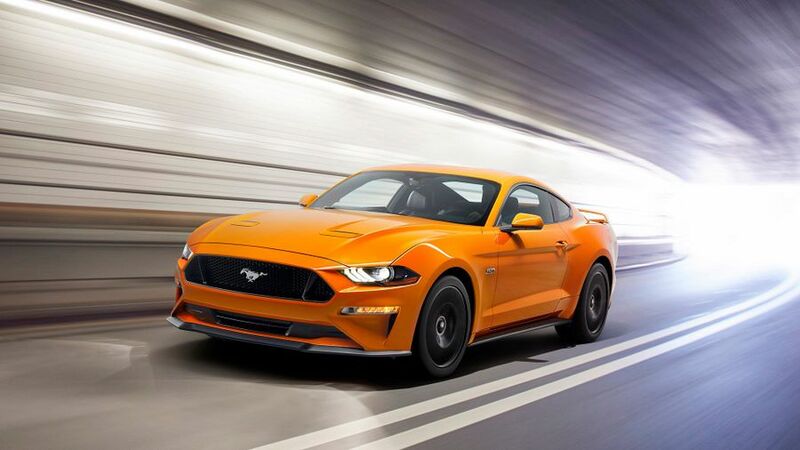 Ford has unveiled its 2018 facelifted Mustang, with slightly tweaked looks, new technology, and new gearboxes. The 2018 Mustang gets a few changes up front, with a new angular bumper, new chin spoiler, some new air intakes, and a slightly lower bonnet. At the same time, the headlights have been tweaked and are now slimmed down with new indicators, and new thin and rectangular fog lamp clusters. At the back, there are some new C-shaped rear lights, and a new, lower black diffuser, housing two or four exhaust tips. And, if you opt for the Performance Pack, you’ll get a rear spoiler on the boot lid. Inside, the interior looks the same, apart from the option of a new 12-inch LCD digital instrument cluster with customisable layouts. Drivers can save their favourite driving setups with the new MyMode function, and there’s some new safety tech, with Pre Collision Assist with pedestrian detection, Lane Keep Assist, Lane Keep Alert, and a Driver Alert system. The flagship Mustang GT will be offered in the UK with a reworked 5.0-litre V8. Ford says it will produce more power and be more free-revving, but is yet to release any specific details yet. The 2.3-litre four-cylinder Ecoboost engine will be available in the entry-level model. Ford has changed the gearbox line-up, too. A new ten-speed automatic gearbox is now optional, replacing the current six-speed unit, and the six-speed manual gearbox has been tweaked for optimal torque. There are no official prices and specs available for the 2018 Mustang yet, but the facelifted car is expected to go on sale in the UK in early 2018.